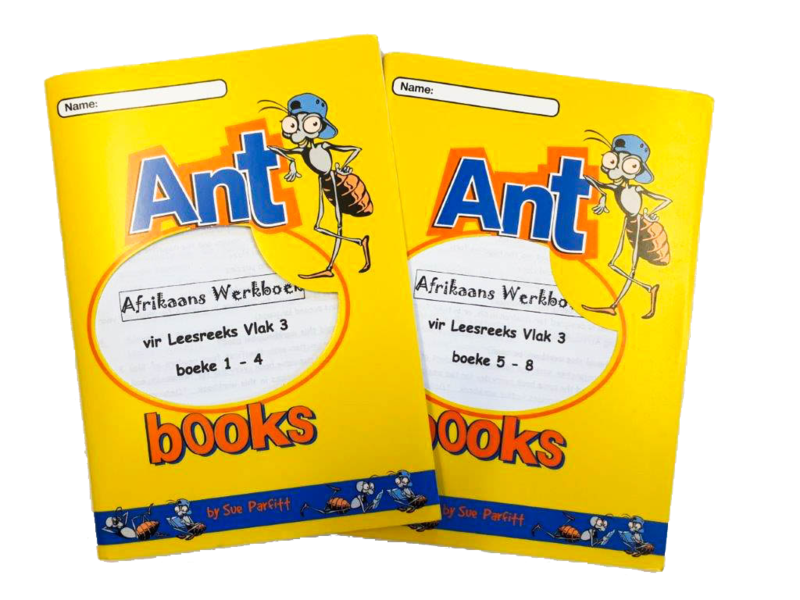 You have come to the right place for Afrikaans material – still my best-seller by far! 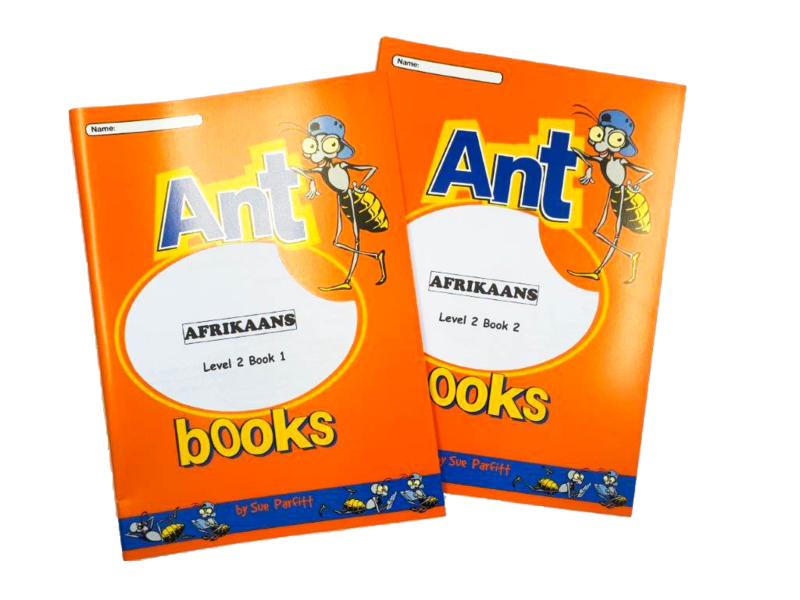 What makes it so popular is that it is a comprehensive programme from GRADE 1 to GRADE 7, covering reading, comprehension, speaking, and all aspects of writing. High school students even use it to shore up their basics! 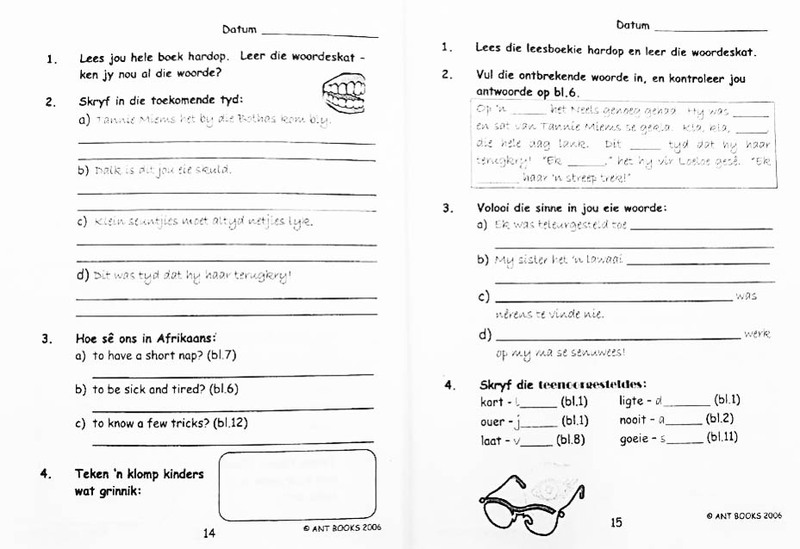 Moms and tutors, so long as you have a basic knowledge of Afrikaans, you’ll cope with teaching this programme to your children: I’ve done it, and have provided detailed guides to help even the most cautious – and English translations! How this Programme came about is the reason for its success. 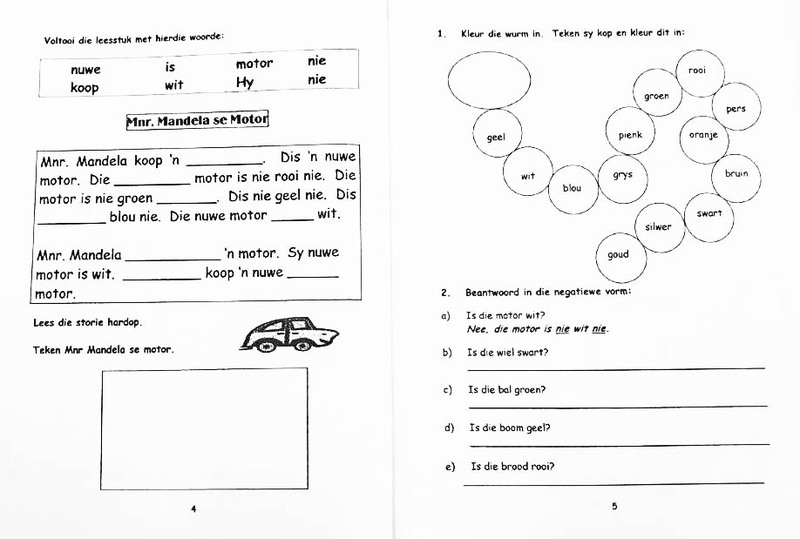 I home-schooled my own two primary school children for a year and, in searching for Afrikaans material, was frustrated and disappointed – and so were they. So I started writing my own stories and based the written work thereon. My first love is creative writing and the stories came flowing out! 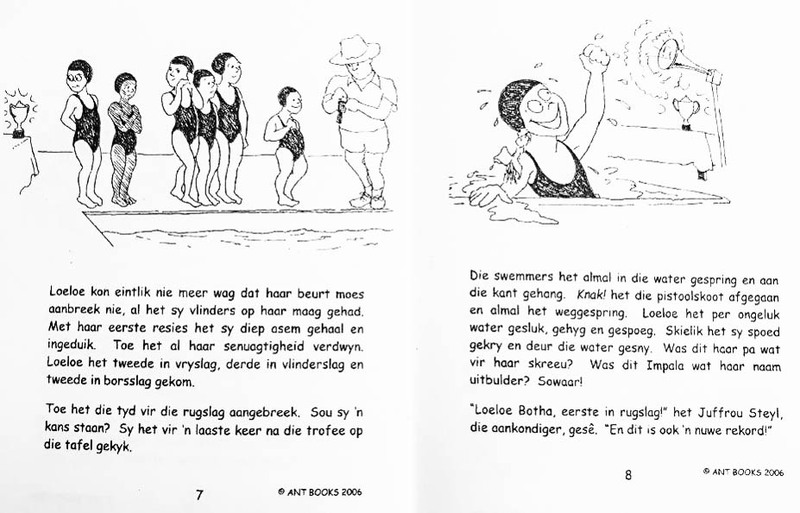 I based them all on a character called ‘Stoute Neels’ and ensured every story was amusing and relevant to our South African children. 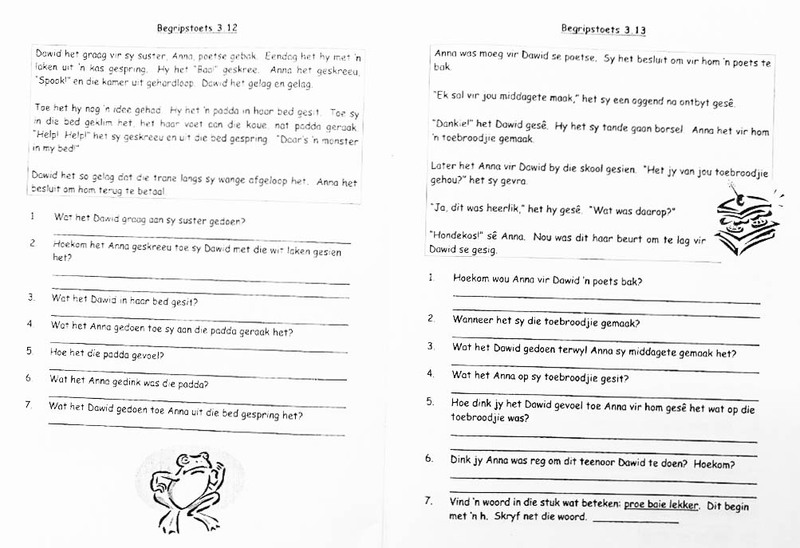 Through the repeated reading of the same reader, I noticed an almost immediate improvement in their fluency and pronunciation and an upswing in their confidence – the vocabulary was ‘going in and sticking’! In such a pleasant way, too. They also loved that the written work was all based on the story they were reading, making it relevant and fun. 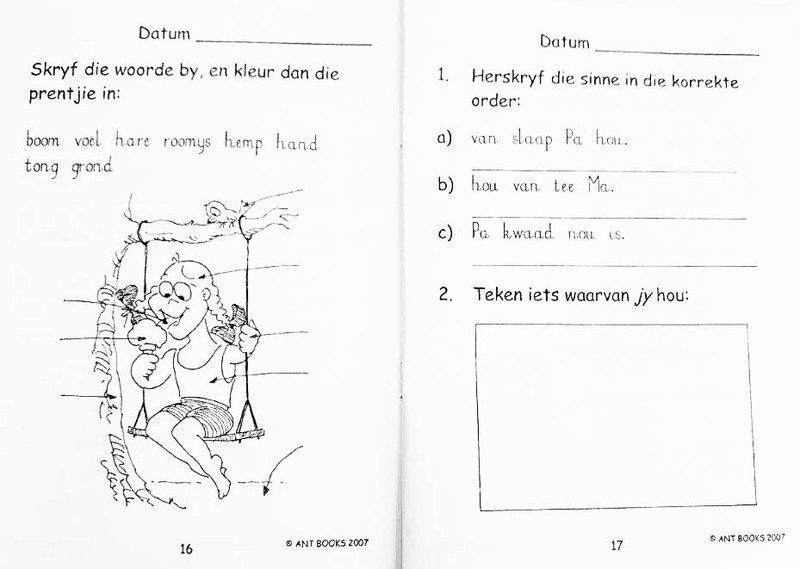 Within a few short weeks, my children were actually beginning to communicate in Afrikaans. 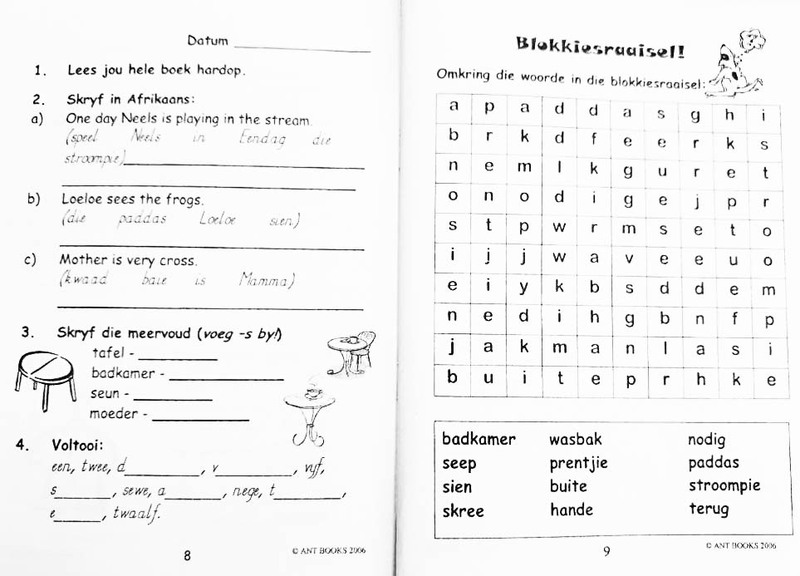 When my son went to Maritzburg College the following year, his Afrikaans was so good that he was placed in the A set for Afrikaans – along with all the mother-tongue speakers. His comment: “I know so many words, it’s easy to work out what the sentences mean”. So to teach vocabulary, you can’t beat this system – parrot-learning lists of words just doesn’t work as well. 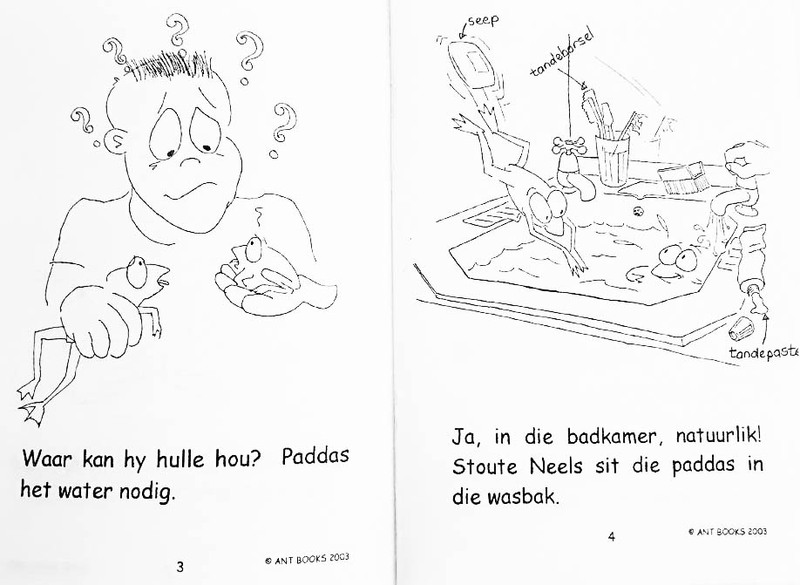 This has been confirmed again and again over the years: parents, teachers and children alike just love the ‘Stoute Neels’ books. To help you, there is a translation of every story into English and a detailed guide. 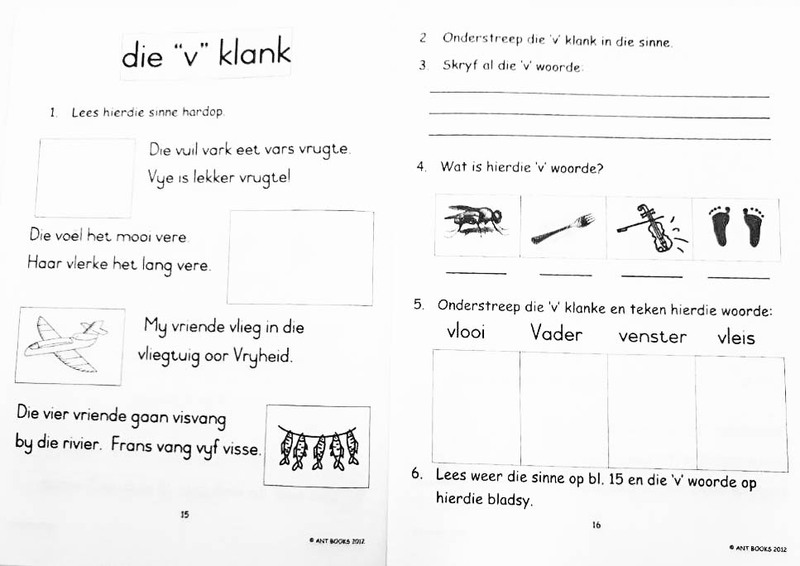 Parents, take note: if you child’s Afrikaans is not yet up to standard, I recommend starting a grade below to build confidence – you want them to say, “This is easy!” and then the battle is won. I started my daughter 2 years back! 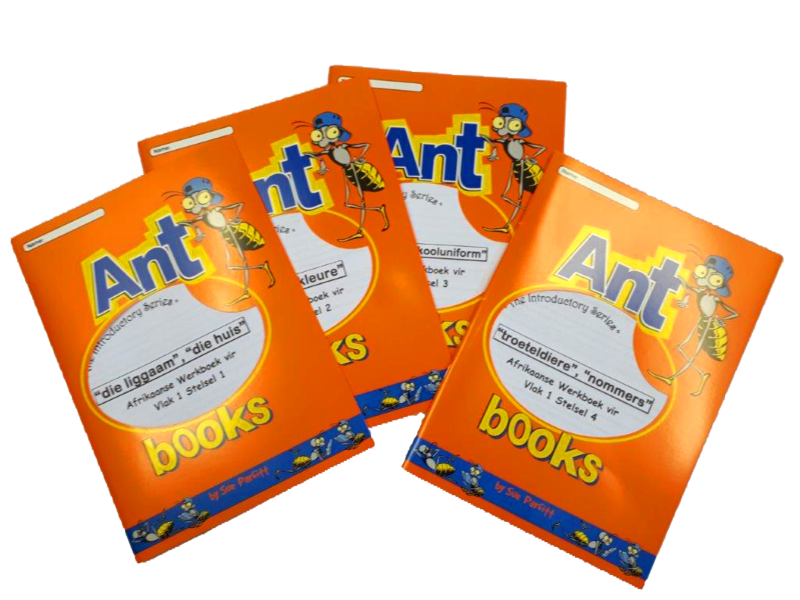 4 x A4 orange workbooks that cover 8 basic themes, 2 per workbook: 1. My body, the house 2. My family, colours 3. 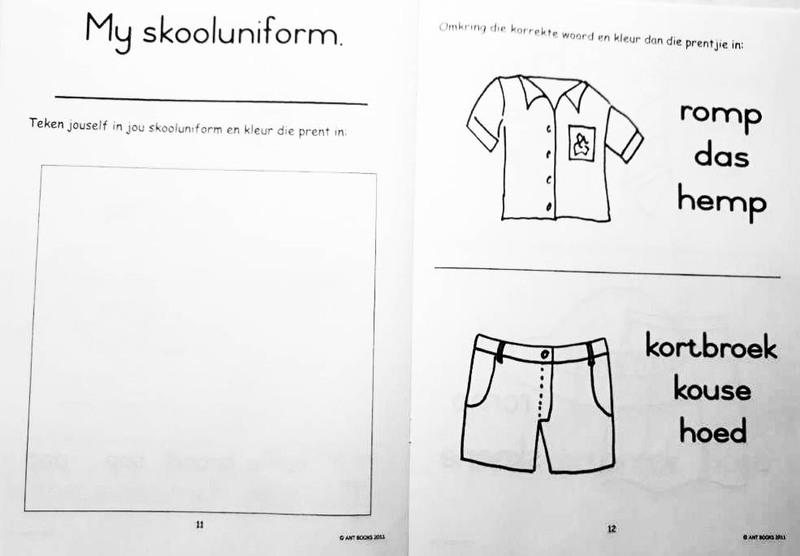 Breakfast (food), school uniform (clothing) 4. Pets, numbers. Great for consolidation after oral work (guide provided). 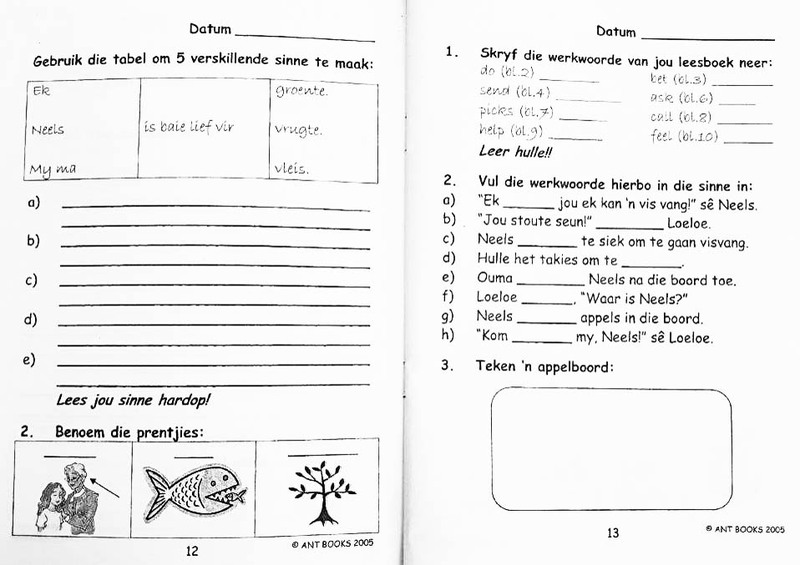 4 x A4 workbooks that cover EXACTLY THE SAME themes as in grade 1, but now the nouns they learnt are in context. 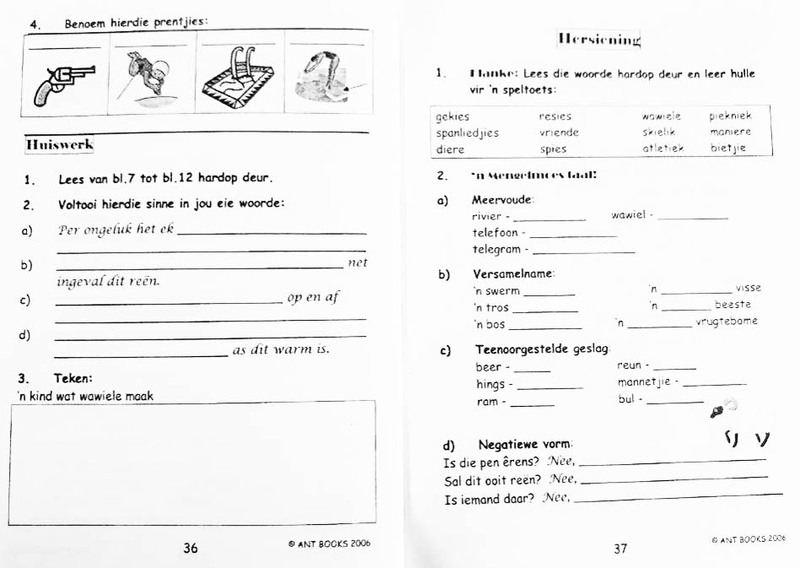 There is reading, transcription of sentences and a little grammar and phonics. 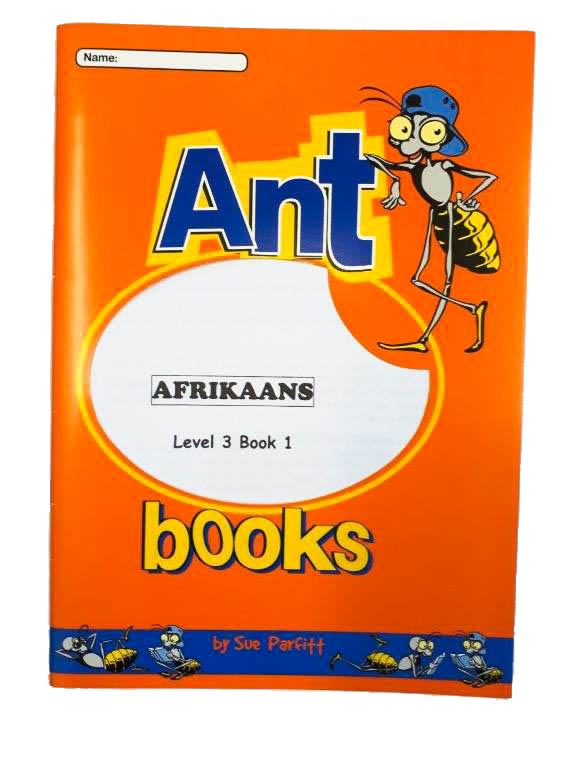 Recommended for Grade 3 (but start your child lower if he is weak or has done no Afrikaans to date). This Vlak introduces ‘Stoute Neels’ (Naughty Neels). 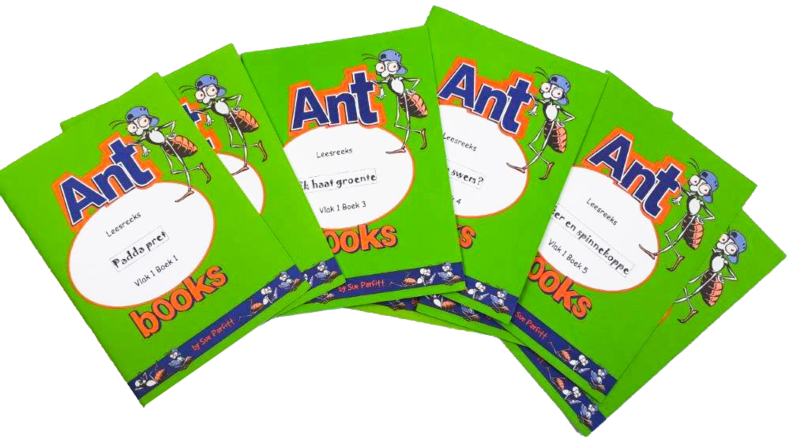 There are 8 readers and 2 workbooks, a translation of every reader and a detailed parents’ guide. 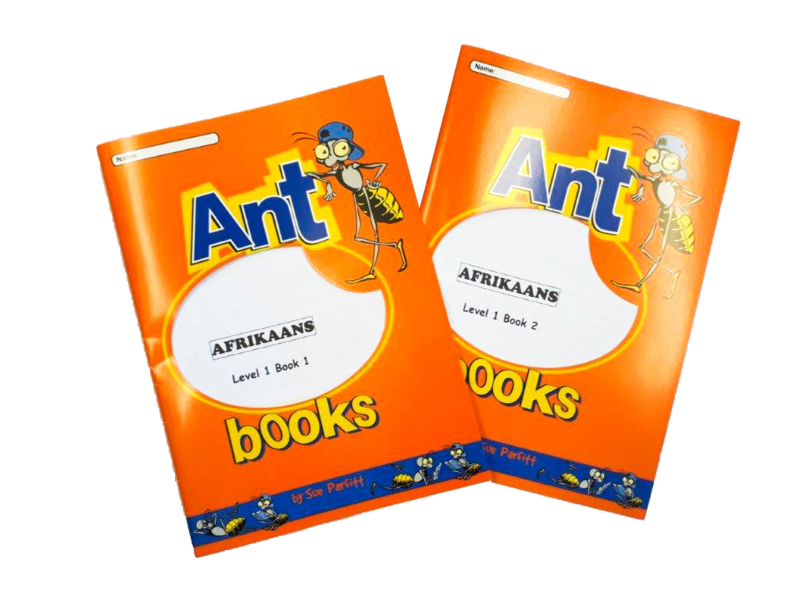 This Programme should take at least 20 weeks, and should be supplemented with our extra Afrikaans material: Klanke, Sigwoorde, Begripstoets 1 bk 1 and 1 bk 2; Afrikaans Level 1 bks 1 and 2 – see supplementary material below. 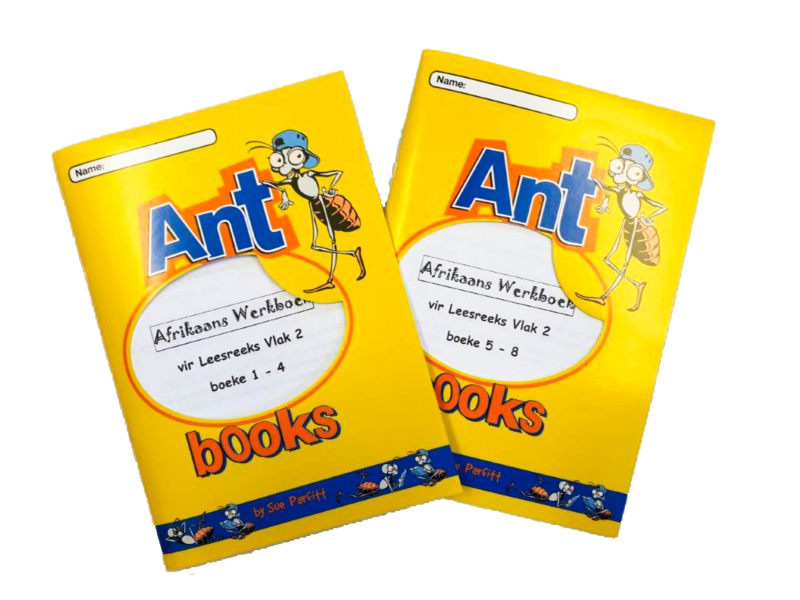 Also recommended are the follow-on set of readers, 9 to 16, for additional vocabulary.. SCHOOLS: READERS SOLD IN BULK ONLY, AND SPECIAL RATES FOR BULK BUYS OF WORKBOOKS. Recommended for Grade 4. 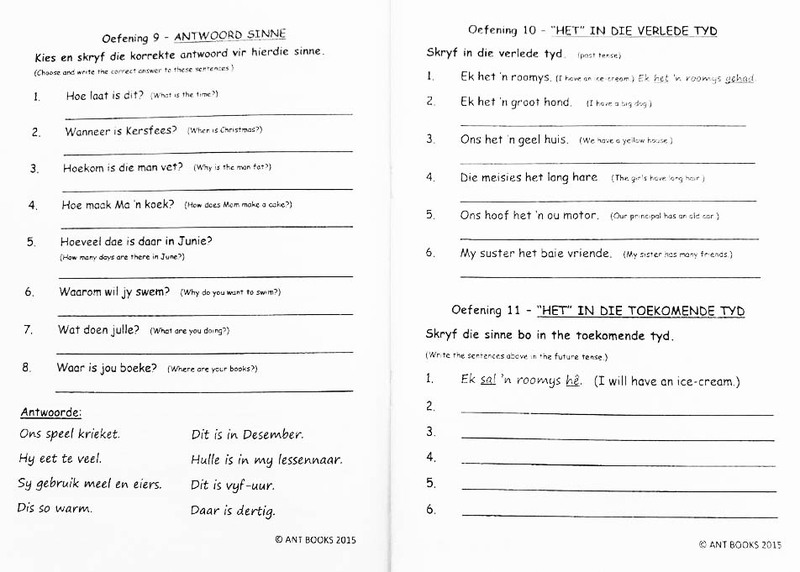 Also 8 readers and 2 workbooks, focusing on Neels at home. 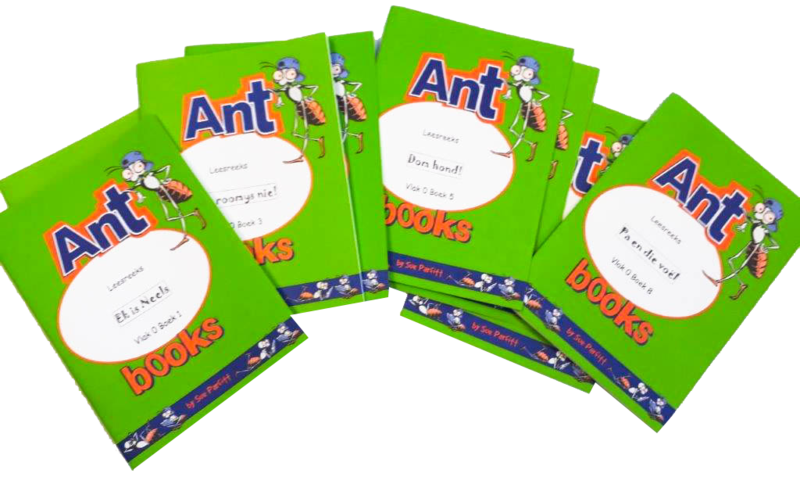 Comes with 8 readers and 2 workbooks, a translation of every reader and a detailed parents’ guide. 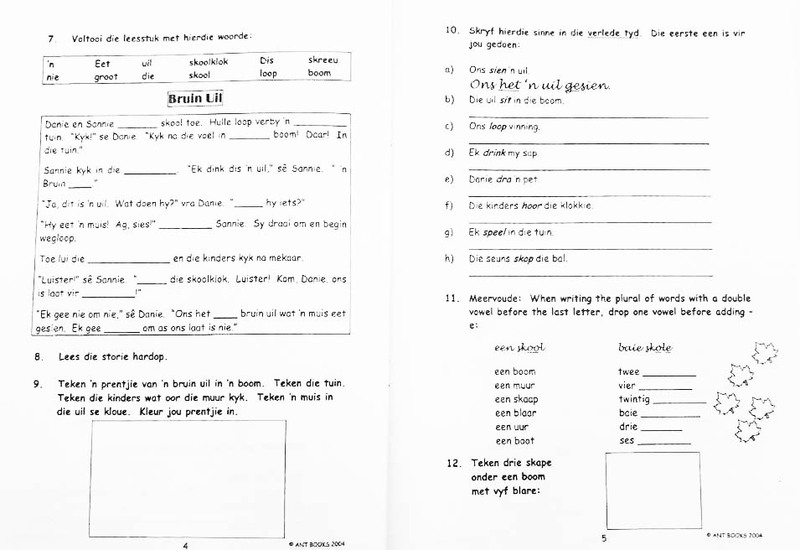 This Programme should take at least 20 weeks, and should be supplemented with our extra Afrikaans material: Begripstoets 2 bk 1 and 2 bk 2; Afrikaans Level 2 bk 1 and 2 bk 2; Sinsbou 1 – see supplementary material (below). Also recommended are the follow-on set of readers, 9 to 16, for additional vocabulary. 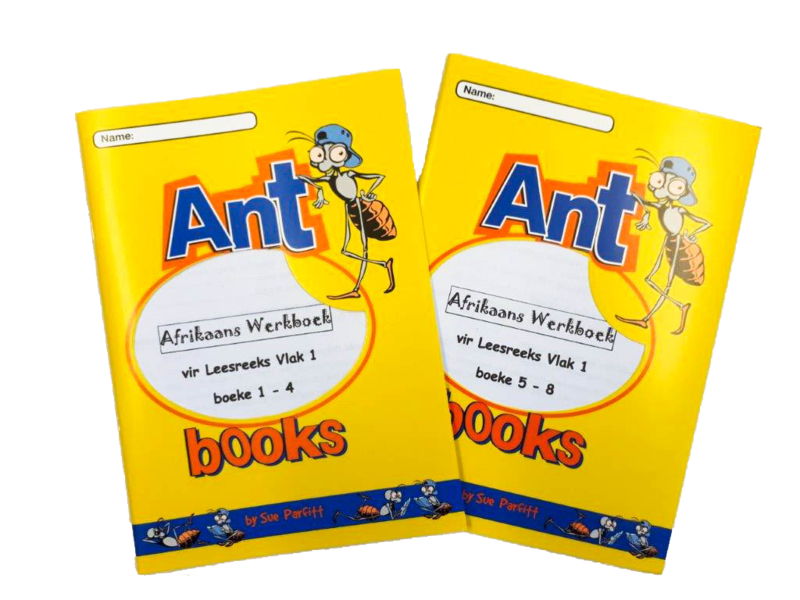 SCHOOLS: READERS SOLD IN BULK ONLY, AND SPECIAL RATES FOR BULK BUYS OF WORKBOOKS. Recommended for grade 5. Focuses on Neels on the farm. 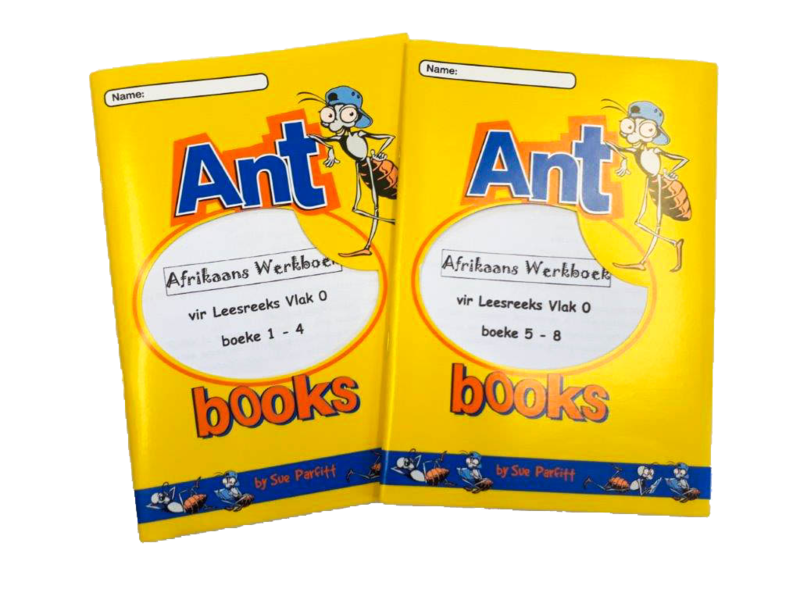 Comes with 8 readers and 2 workbooks, a translation of every reader and a detailed parents’ guide. 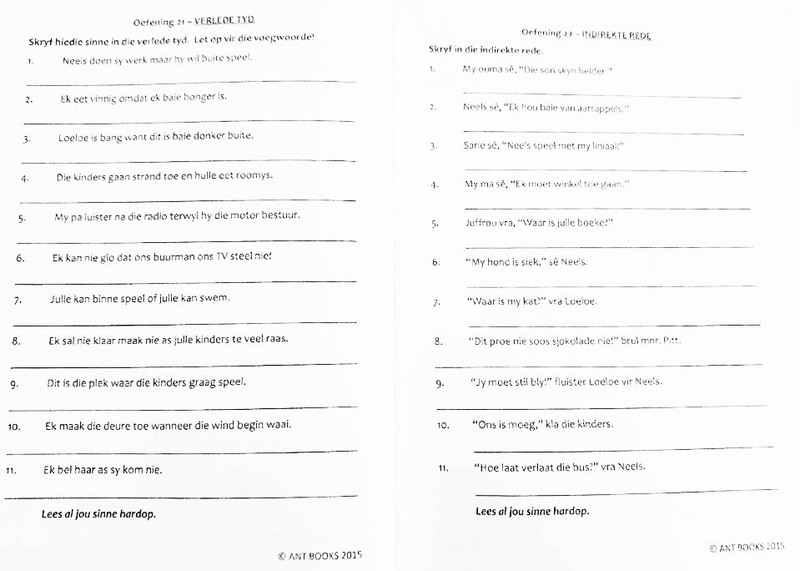 This Programme should take at least 20 weeks, and should be supplemented with our extra Afrikaans material: Afrikaans Level 3 bk 1; Begripstoets 3 bk 1 and Sinsbou 2 – see supplementary material (below). Also recommended are the follow-on set of readers, 9 to 16 for additional vocabulary. Recommended for Grade 6. 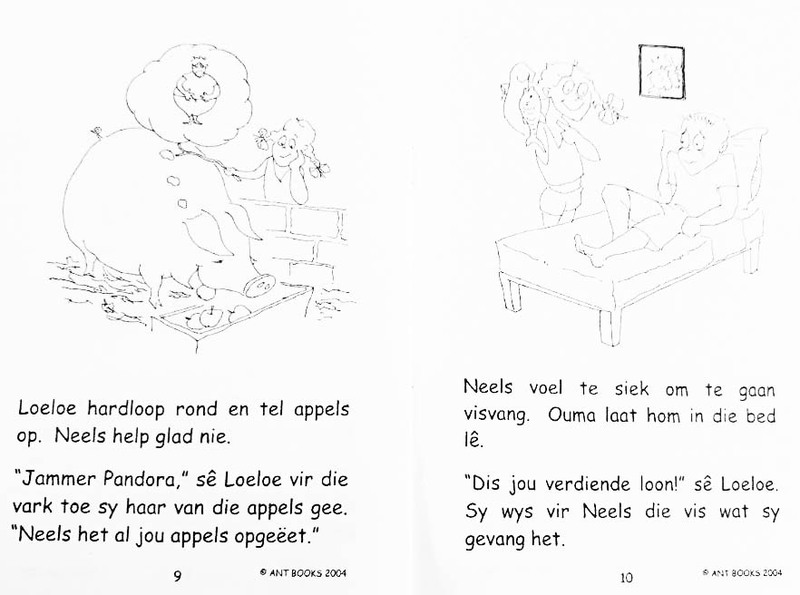 Focuses on Neels and his dreadful aunt, Tannie Miems. 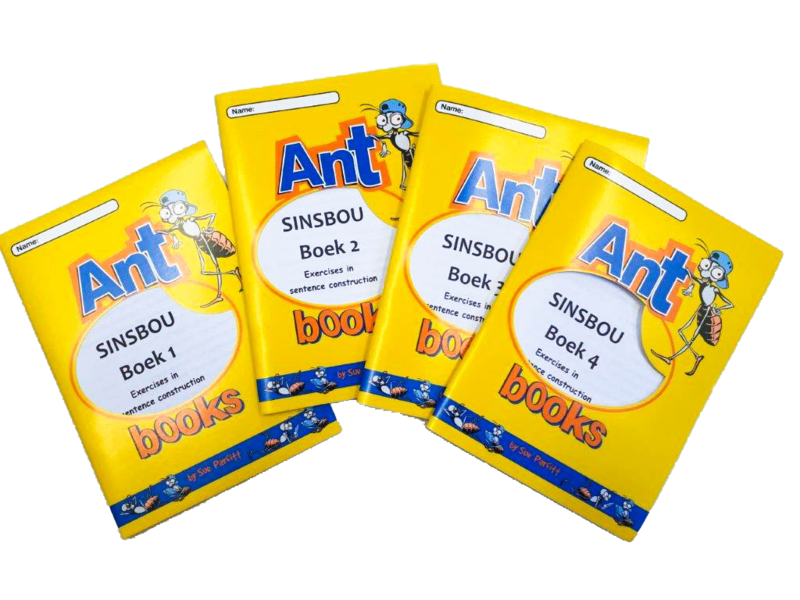 Comes with 8 readers and 2 workbooks, a translation of every reader and a detailed parents’ guide. 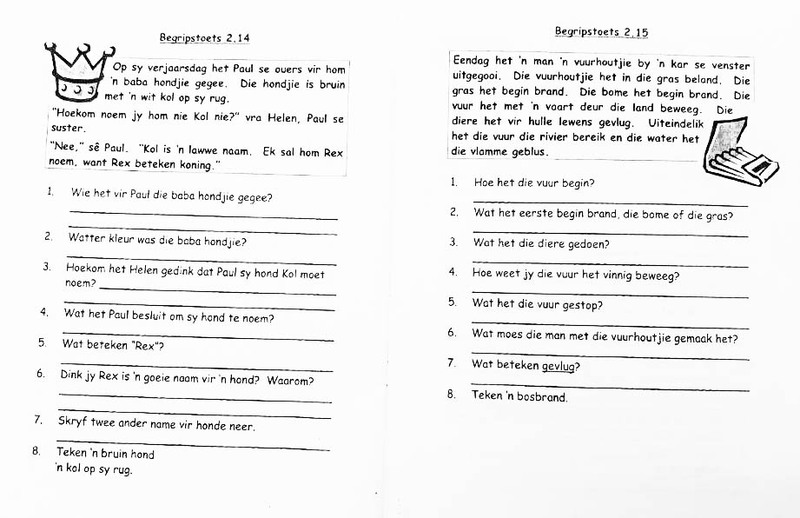 This Programme should take at least 20 weeks, and should be supplemented with our extra Afrikaans material: Begripstoets 3 bk 2 and Sinsbou 3 – see supplementary material (below). Recommended for Grade 7 and weaker high school students. Focuses on Neels at school. 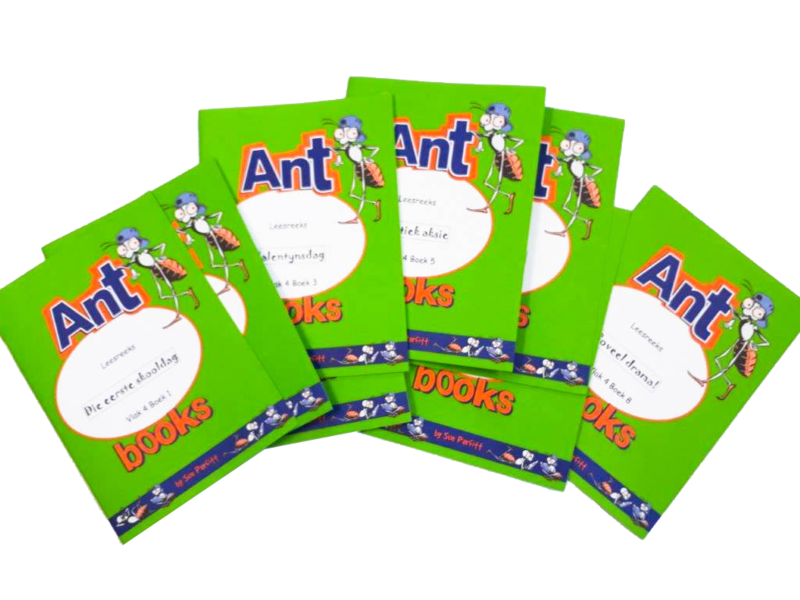 Comes with 8 readers and 4 workbooks, a translation of every reader and a detailed parents’ guide. 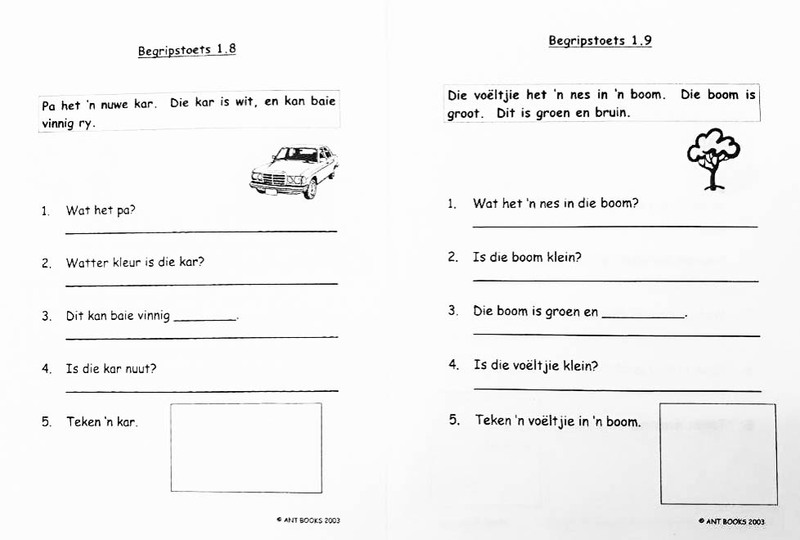 This Programme should take at least 20 weeks, and should be supplemented with our extra Afrikaans material: Begripstoets 4 and Sinsbou 4 – see supplementary material (below). 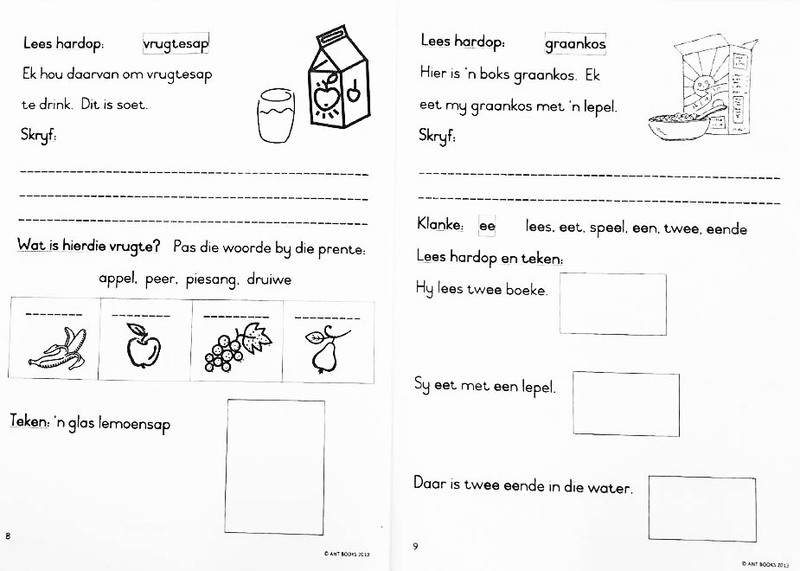 As explained in the teacher guides that accompany each programme, I recommend following the Afrikaans Programme (above) from Mondays to Thursdays, then doing a supplementary exercise and tests on Fridays. Suitable for Grade 3. 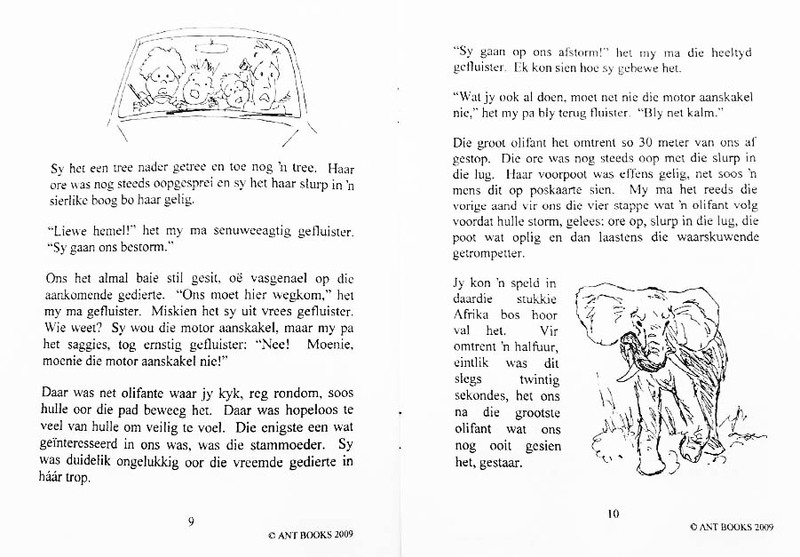 Every 2 pages a mini-theme, based on Stoute Neels. 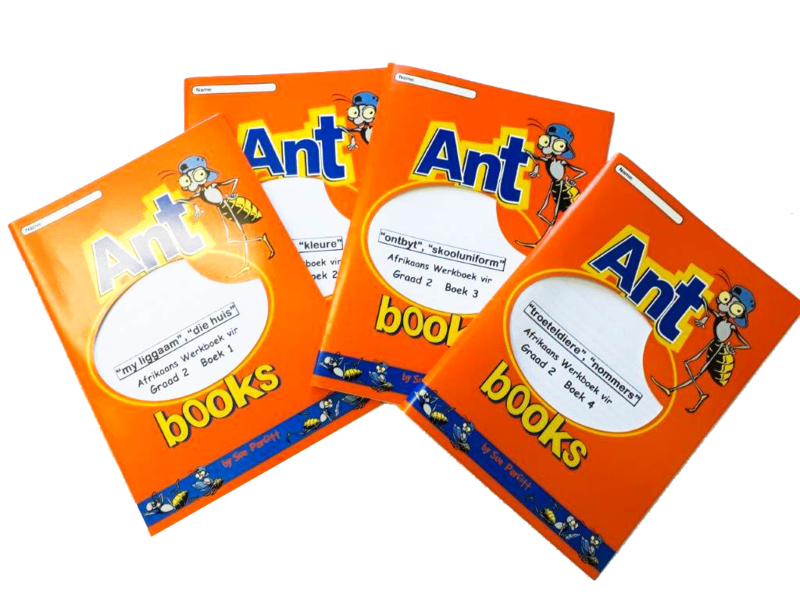 Covers vocabulary extension, comprehension and reading, sentence construction and phonics. An ideal supplement to the Vlak 0 Programme (above). Suitable for Grade 4. 2 mini-themes in each book. Separate from Stoute Neels to broaden vocabulary. 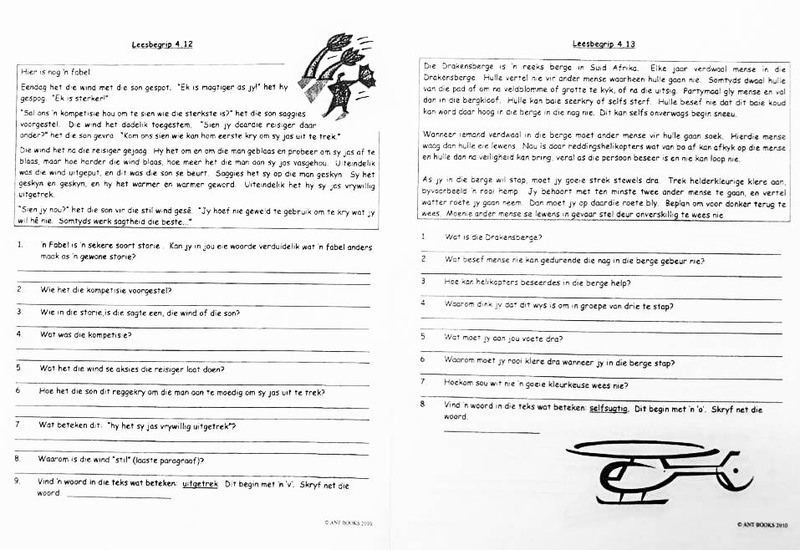 An ideal supplement to the Vlak 1 Programme (above). Suitable for Grade 5/6. 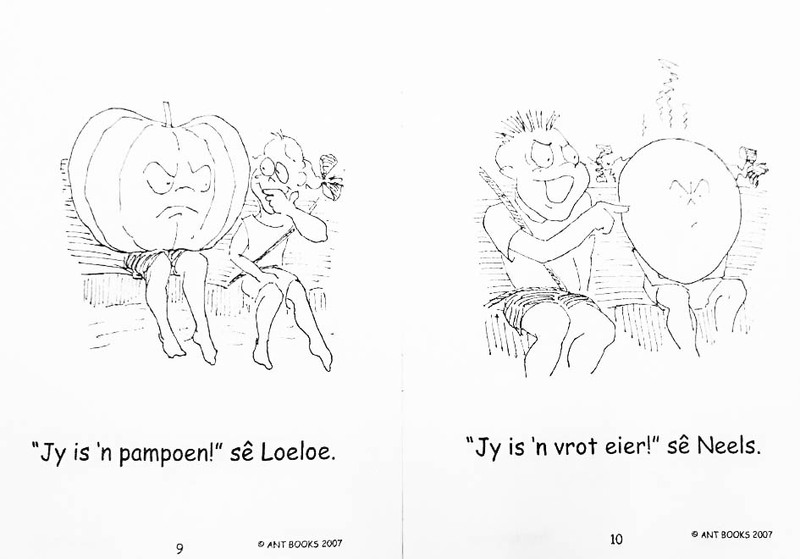 Contains 2 mini-themes separate from the Stoute Neels series, but an ideal supplement to the Vlak 2/3 Programmes (above). A must for all beginners, from Grades 2 to 4. 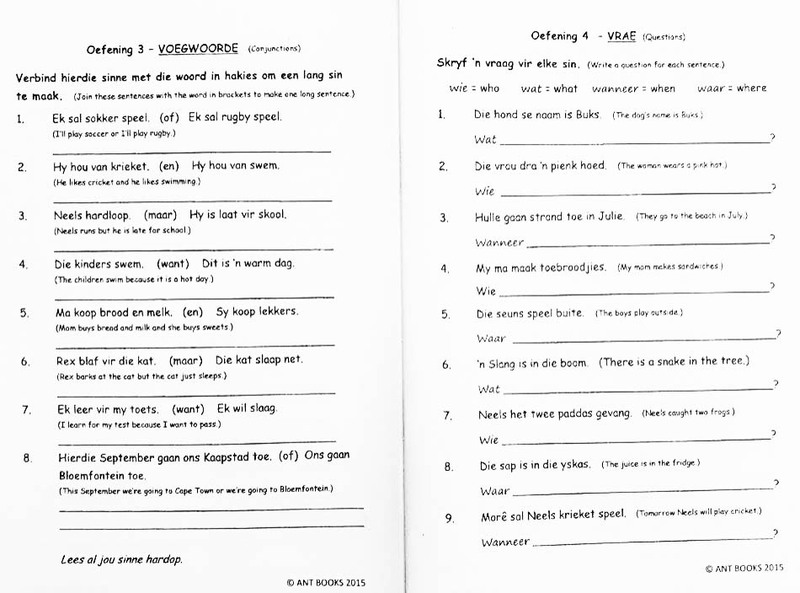 The 300 most commonly used Afrikaans words, arranged in order of difficulty. 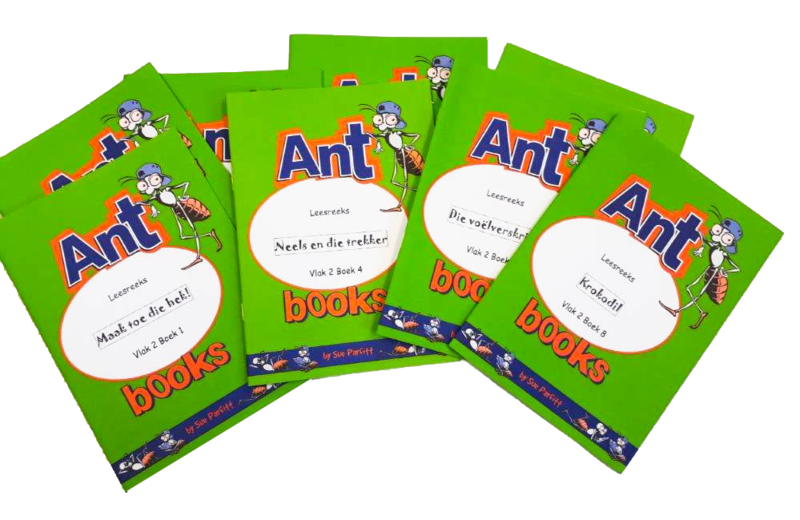 Use for reading, transcription (spelling), in oral and written sentences. 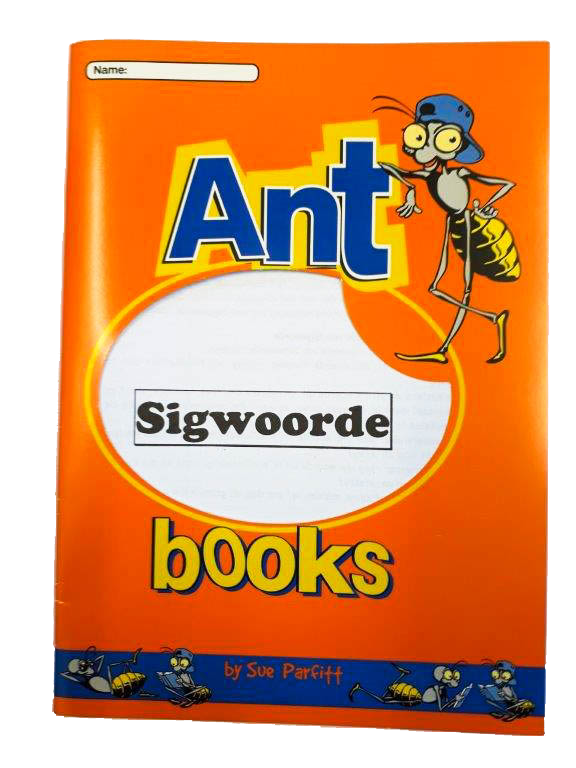 Possibly our best seller after the Afrikaans Programme itself. 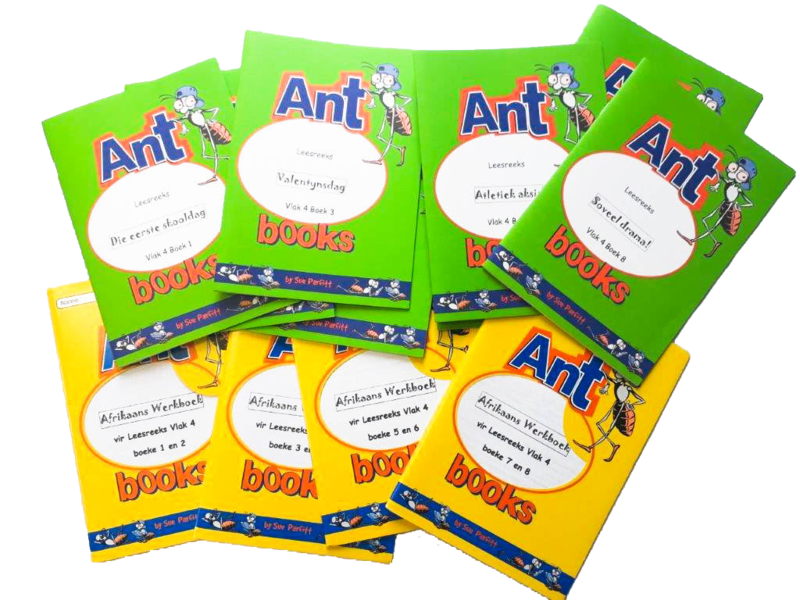 From the very simple reading passage and questions to the more advanced – 7 workbooks of increasing difficulty. Yet each one is concise to prevent boredom and frustration. 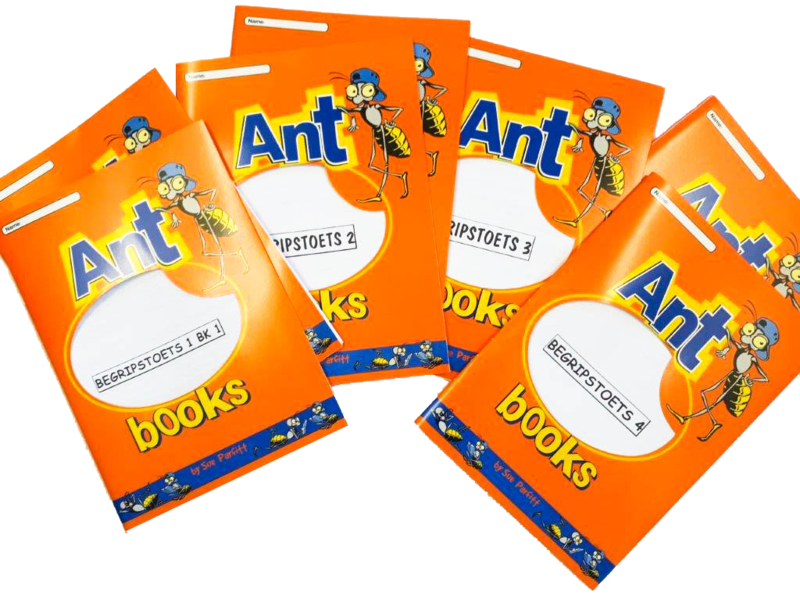 Use for unprepared reading, as well as to improve vocabulary. 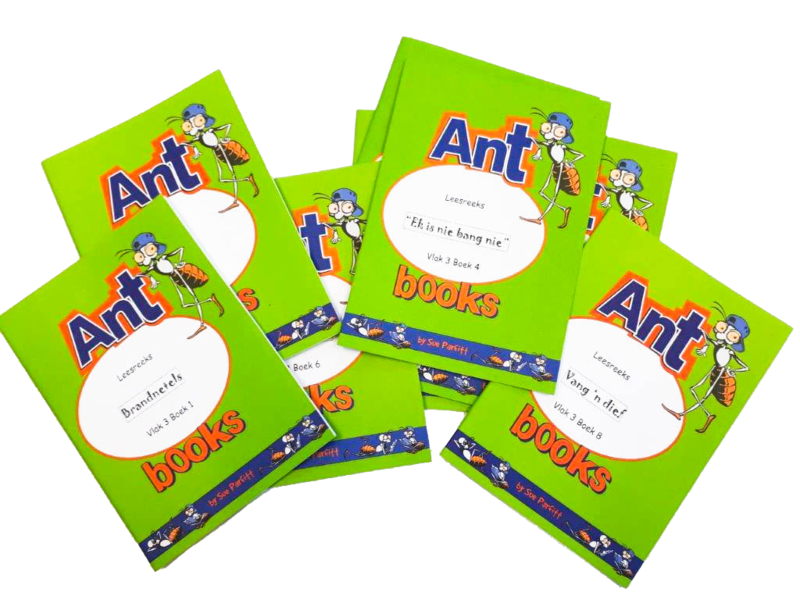 There are 4 in the series and focus on guided sentence-construction: word order; the negative form; tenses; direct and indirect speech; using conjunctions to join sentences, etc. 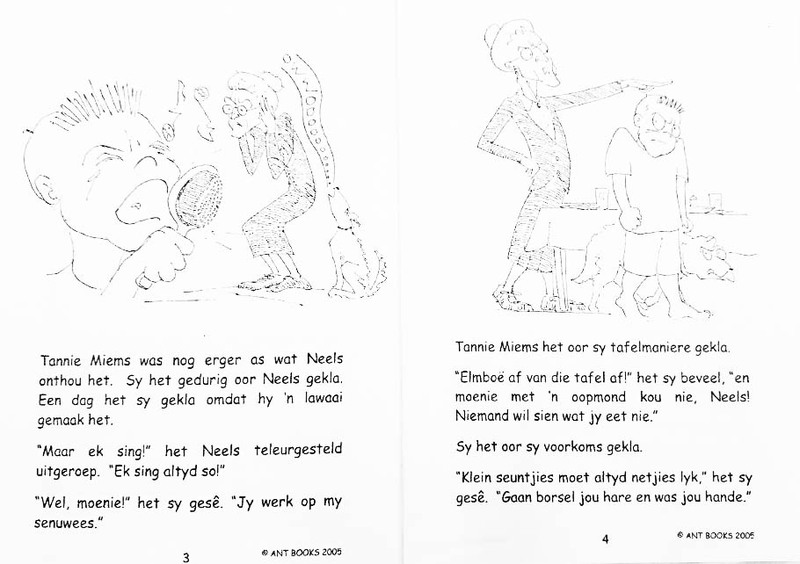 Loosely linked to Stoute Neels and the Afrikaans Programme, but can be used as stand-alones. 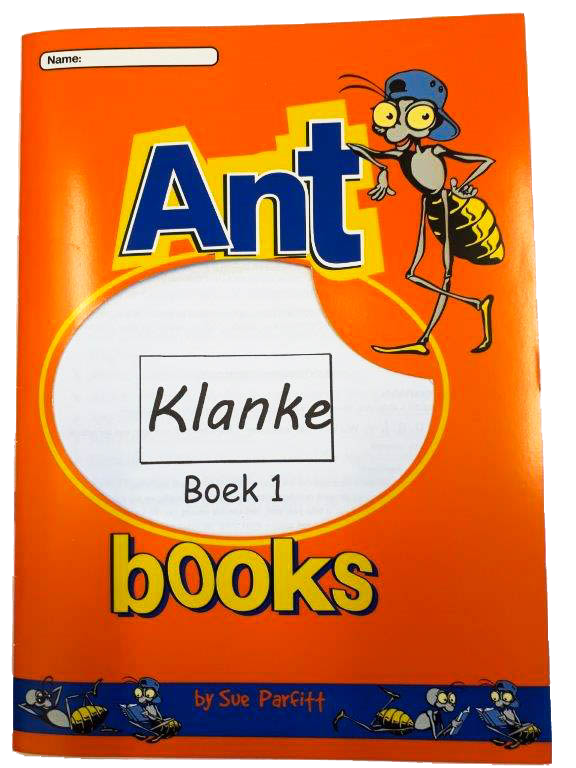 ANSWERS ON REQUEST – please email sue@antbooks.co.za. 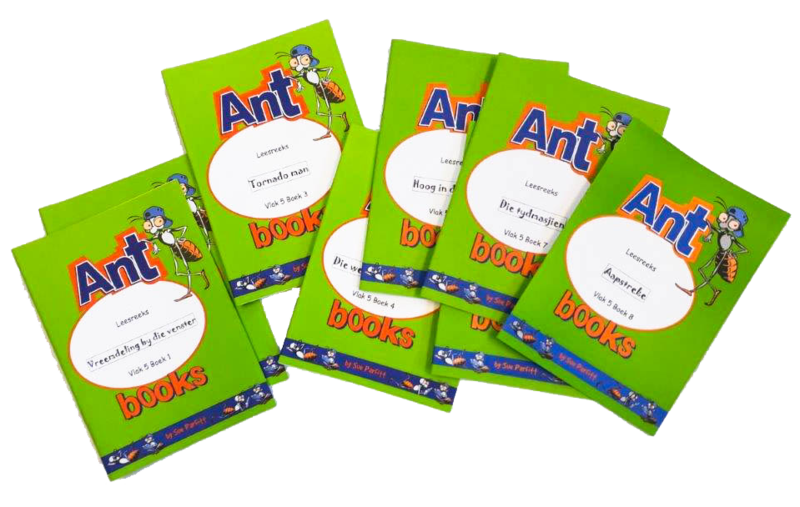 I term these our ‘teenage readers’ – content that will interest the older child. 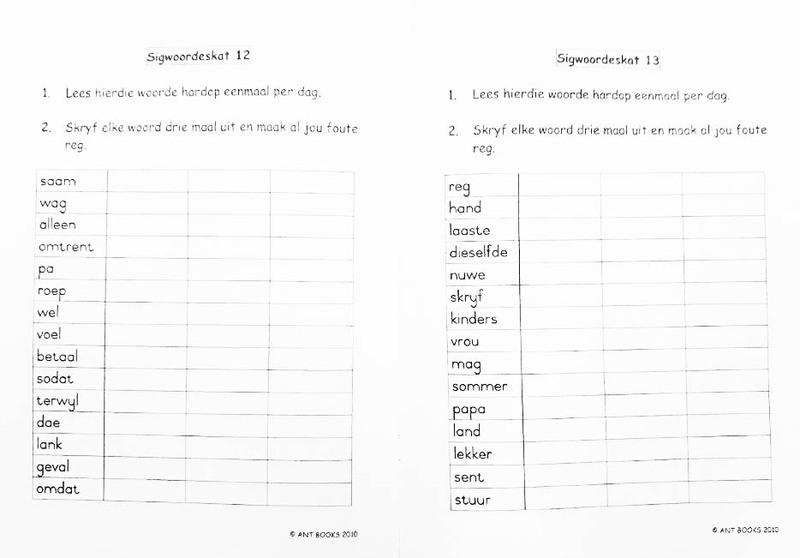 Still based loosely on Neels and his family, there are now 120 words per page, and will greatly help the older child who wants to improve her vocabulary, fluency and word order. 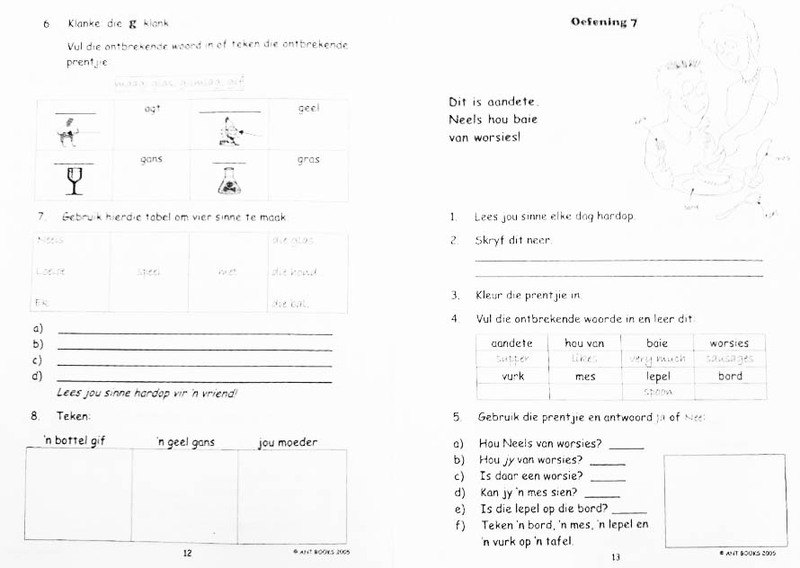 No workbooks available.